Remember that controversy not too long ago about Netflix throttling Verizon and AT&T data streams because of the carrier’s data caps? While that wasn’t a particularly great PR move for Netflix, it’s prompted the company to roll out more controls to its mobile app to allow users to adjust how much data they want to use. The update gives you a way to tweak the bitrate of your Netflix stream while on a mobile network, with the default setting allowing you to stream around 3 hours of video per gigabyte of data. Netflix found this bit rate to be the best compromise between video quality and video efficiency, so if you don’t mess with anything that’s the setting you’ll be using. It’s also probably the setting that Netflix was using for Verizon and AT&T customers previously. You can go up or down on the bitrate from within the app, though, so if you’d rather conserve as much data as possible, you’re free to do so. You’ll have to deal with a pixelated video stream, but if you’re using a smaller screen or something that’s not full HD, it might work for you. You can also completely turn off the restrictions if you’d like, so if you have an unlimited data plan or just don’t care you’re free to burn up as much data as possible and get the best-looking video you can. It’s excessive, but it’s an option. We love options. You can also restrict the app to an Off setting that only lets you watch Netflix on WiFi. 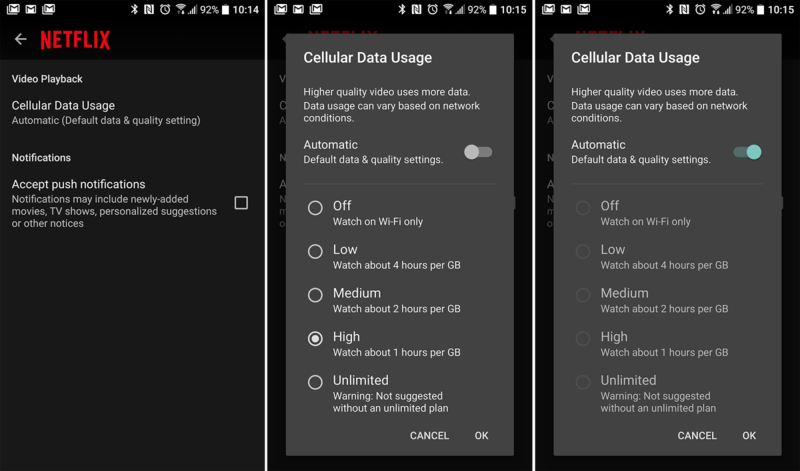 To tweak all of this, head into the Netflix app, swipe out the side menu, jump into App Settings, and then look for the “Cellular Data Usage” section.